For Theater class at Sheridan we were assigned the creation of a character. We had to describe the character and their history and then create an image to represent them. The year is 1937 and Lulu Davies is 47 years old. She is a fading starlet of the silent pictures. When she was young she was a stunner - and was wanted by every millionaire in Hollywood and fiercely envied by every girl. Those days however, have turned to dust. Lulu Davies, born Sally Moore, is the daughter of a Mormon pastor from Utah. Being born with raven black hair and piercing pale blue eyes, her stunning beauty attracted the attention of many local young men, to the great displeasure of her father. Raised in a house with extremely austere moral values, going to the pictures was strictly forbidden. Lulu managed, with the help of one of her many admirers, to sneak out one night and go to the movies. Enthralled with the glamour of the heroine on screen, Lulu decided at once that she would become a movie star. Wishing to escape the tyranny of her father, and the poverty of her rural life, she ran away from home at age 16 and hitchhiked to Los Angeles. Changing her name to Lulu Davies, she fought (or rather slept) her way the top of the biggest Hollywood productions. She became an icon, and was adored, envied and filthy rich. Her success was hard won, and she would not under torture reveal the truth of her upbringing and childhood. 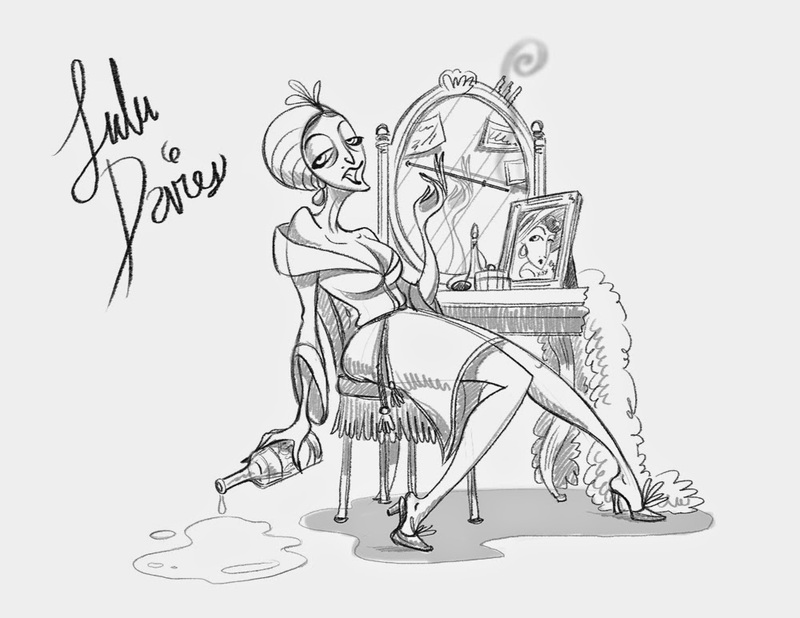 Though not by nature bad or insensitive, Lulu's life has turned her into a rather cold and self-centered diva. Trying hard to erase all traces of the young Sally Moore, she was forced all her life to play a part. She would never open up to anybody for fear of detection, and her Hollywood life was spun around lies. Her every day persona is a role she plays. She wishes to portray a clever, urban, woman of the world, used to endless luxury and a life of ease and pleasure. She has played this role for so long, that Lulu herself no longer knows if any part of her personality is quite her own. As films started turning into the "talkies" Lulu began to see herself passed over in favor of young and fresh upstart actresses - of which there was an abundance. This was a great blow to her ego and self confidence. Having always lived in fear of her past, this new fear of aging took its toll on her personality. Lulu is extremely ego centric and vain. She flies into rages at the smallest provocation. She speaks loudly in a theatrical and dramatic fashion. She treats people of lower class with distain and venom - her fear of ever being associated with them being the driving force in her hatred. Lulu is conversely extremely determined and focused. Her lack of education was balanced out by a instinctual understanding as to the weakness of others - a clear path to getting the upper hand. She believes that happiness lies in riches, awards and continued success. She will not admit to herself that the two things that are lacking in her life - acceptance and real love - are what she secretly longs for. Constantly dissatisfied, Lulu continues to lie to herself and the world around her clinging desperately to her dying career.